If one were to ask an educated youngster to name a famous Egyptian lady from history - Chances are, nine out of ten, you will hear the name of Cleopatra issue from his lips. And we should not blame him for it. The legend of Caesar and his nemesis in the arms of this sensuous Greeko-egyptian queen has been immortalized, exaggerated and twisted countless ways in scholarly books, popular fiction and visual arts that it is easier to conjure her image in our minds (aided by Liz Taylor, of course) than anybody else from that era. While it is true to a great extent that her beguilingly voluptuous beauty, charm, cunning wit and sparkling political acumen helped define the geographical boundaries of ancient Roman Empire - and its subsequent repercussions on the political topography of Europe; However, the intellectual continuity and vigor of Platonic thought and Greek sciences found its anchor, articulation and consummation not in the guiles and seductive lore of Cleopatra ,but in the vibrant, fertile and beautiful mind of yet another lady: Hypatia - scientist, researcher, philosopher, orator and teacher in that great city of Alexandria, Egypt - one of transforming legacies of Alexander’s audacious conquest of the east. Though his vision of a universal Greek Empire from the Aegean Sea to the Indian Ocean remained only a figment of his dream, he however succeeded in carrying with him the entire intellectual outpouring of his native Greek land and collect them in what was undoubtedly the most comprehensive, well stocked library and vibrant learning centers of the ancient world - The Alexandrian Library. Hypatia taught and studied there along with her protective father and dedicated band of students- both pagans, Christians and slaves alike; devoted to understanding the books of Aristotle, Aristarchus, Plato and the scientific adventures of Ptolemy- whose geocentric model of Cosmos was still the accepted truth for most part of civilized world. Fourth century Rome must have been a curious time to live in. After nearly ten centuries of Polytheistic faith and practices, their society was slowly but pervasively inundated by the waves of Christian faith. Emperor Constantine’s sudden conversion to Christianity and his momentous decision of making it the official religion of Rome, was beginning to have its rumbling effects across different strata of Roman citizenry. The theological, ethical and teleological differences between Paganism - which still held on tenaciously to its extroverted, life loving outlook; and the creed of Christ which advocated a monotheistic interpretation of human endeavor forcing a life stripped of any pleasures aimed primarily to make man fit for second coming of God- began to show signs of rupture at its seams. Christianity’s closed and adamant interpretation of Jesus, the Nazareth’s word and his redemptive promise as final, left no scope for any kind of intellectual freedom and pursuit of knowledge that were traditionally considered hallmarks of a classical Greek mind , which had continued unbroken and nourished and replenished for centuries before Christianity was even born. The aisles of the library in Alexandria contained, on a conservative estimate, contained around 40,000 scrolls on a variety of subjects ranging from the most esoteric to mundane. Neatly catalogued, commentated, copied and diligently studied - it represented almost a complete repository of Western thinking. 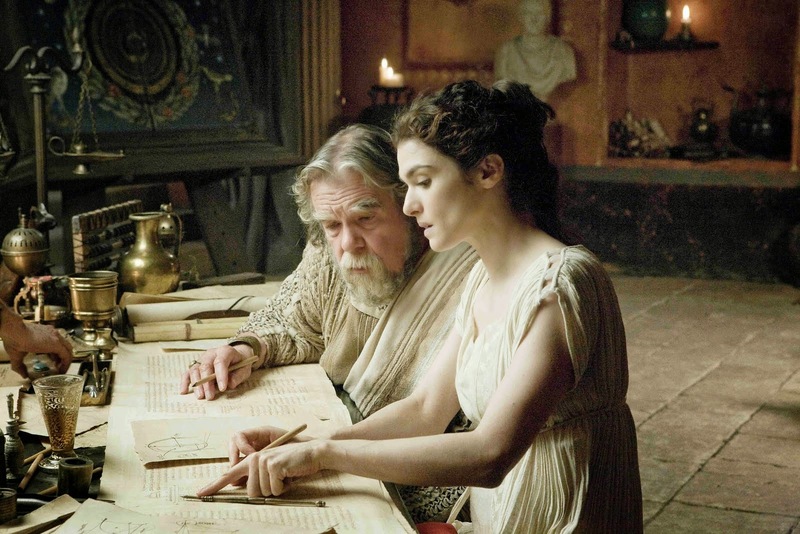 And Hypatia was heir to that literary, philosophic and scientific tradition. She lived, studied and taught in the sprawling courtyards that surrounded the library. It was called the Agora, or the forum. From whatever little we know of this remarkable Lady, it is clear that she was accomplished, revered and honored as one whose life centered on study, experimentation and dissemination of knowledge and wisdom. She is said to have had a manner of ease and grace, which in a woman, can really be beautiful to behold - if it is also radiant and suffused with the fire of contemplation and learning - which in Hypatia’s case - it was. Records that survive mention that Men from all walks of life flocked to the Agora to hear her expound with clarity the complexities and ambiguities of Ptolemaic systems, music of spheres and general ruminations on Human existence and destiny. Her self-possessed demeanor clad in flowing tunics, large black Mediterranean eyes, luxuriantly cascading hair held neatly in captivity in traditional Greek style and her easy gait - held students spellbound. Some admired her rapturous feminity, others soaked in her intellectual brilliance and young students looked upon her with an adoring eye of child. In her assembly, there were no differences of religion, caste of kind; and the only credo allowed was unbiased exploration of truth and study. In fact, classical historians are more or less unanimous that Hypatia is perhaps the last and the most resplendent of that line of Greek Philosophers, naturalists and thinkers (predominantly male - all of them) who graced the world stage in the early period of Western history. And in her untimely death, or May we say, slaughter, the dark ages in Europe began. It is unfortunate that Hypatia’s life has not found itself more prevalently represented in Literature and other arts. Perhaps, when the library of Alexandria was burned down, we lost most of her writings and teaching notes; and what little remained did not offer any feminine gossip for artists to weave their thread of imagination around her life. What can you write or sensationalize of a woman who lived with great austerity, grace and unbounded inquisitiveness for knowledge. Art reigns supreme when form and pretense predominates over substance, and that is the reason one finds Cleopatra mentioned and relived in a million artistic expressions; and Hypatia is rarely referenced except in a few stray works of books and paintings. Cleopatra is the stuff that fantasies are made of, and Hypatia…. Well!! When I started writing this essay, the idea was to review a movie I saw recently - “Agora”. 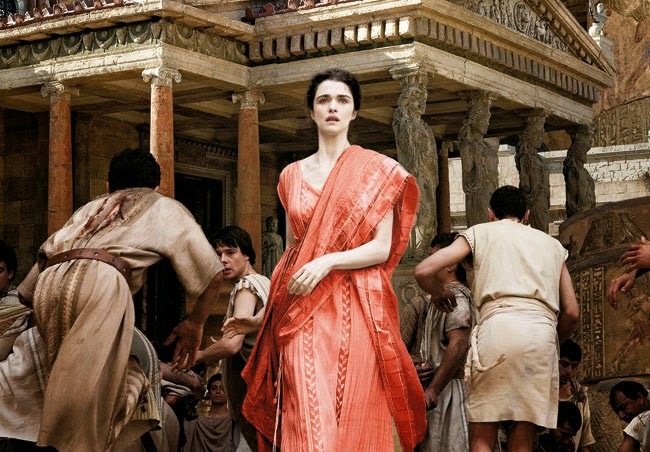 A Spanish film made in 2009 that captures the life of Hypatia during the turbulent 4th century AD. But then, I could not talk about the movie without giving my readers a context; and I did not imagine that it would end up taking several paragraphs before I get here. Anyway, I loved the film; and I was so glad to see the life of Hypatia take shape and form on screen in a manner that was eluding her for so long. Admirably played by Rachel Weisz (you will remember here as the inquisitive Egyptologist from the film “Mummy”); she suited the role to perfection. Her luminous deep eyes captures the legend of Hypatia’s composure and serenity and her characterization displays an understanding of Hypatia’s throbbing passion for astronomy and sciences in general. 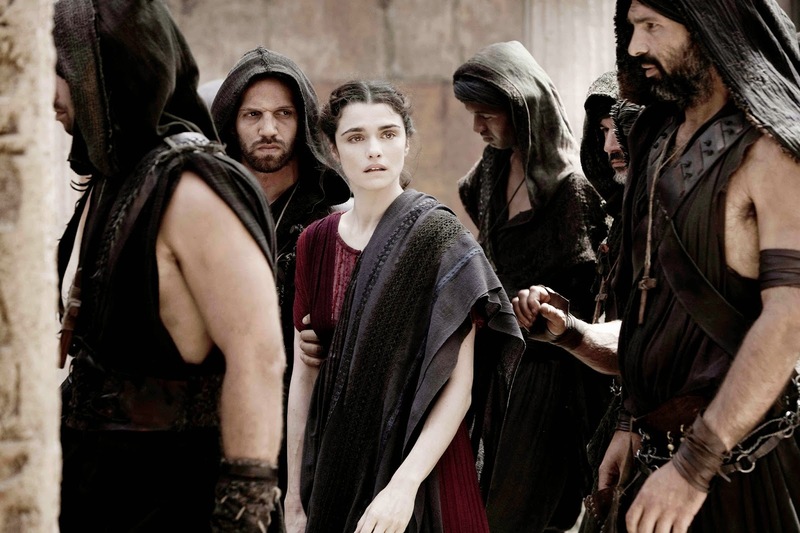 Though the movie is set in a calamitous period when Christians, Jews and Pagans cut each other’s throats in the name of a divine belief, the narrative of the film focuses on Hypatia’s unrelenting commitment to seeking truth by direct observation and experimentation and not succumbing to pressures of belief and conversion. When she stands in the middle of Roman Christians and silently states “I believe in philosophy” - she makes a claim for entire generations of men and Women, in the past and future – for whom life needs to be understood and lived through self-enquiry and not by blind dogmatic creeds that have no observational validity. Director Alejandra Amenabar deft control of script and screenplay keeps the movie flowing along, despite its deep theological undertones; and in my opinion, done a wonderful job providing the feel and aura of 4th century Alexandria. Historical accounts have it that Hypatia was dragged along the streets of Alexandria by a Mad Mob, her skin sheared with Oyster shells and cut in to pieces in front of the Library that she so revered. But Alejandro chose to give his fictional Hypatia a more sober ending. And rightly so. In conclusion, it is ironical that Hypatia’s observation of Earth’s orbit being elliptical and not circular was consummated by Johannes Kepler 1200 years later. Unfortunately, none of her writings survive, but from what we gather from later accounts, it is clear that Hypatia was very close to disproving the geocentric perception of cosmos and proposing a Heliocentric model. That would have been a magnificent achievement in itself. Had she lived in another age or time, her work and life would have taken a different turn, and posterity would have treated her more prominently. But I guess, that falls within the sphere of never ending debate in historical contingencies. In Stephen Greenblatt’s Pulitzer winning book “The swerve”, he observes: “the death of Hypatia effectively marked the end of classical Greek age…”, and it is true to a larger extent. Because, the next time Europe and western world would see such a flowering of thought and independence would be after nearly thousand years, when Thomas Aquinas, Ockham and Petrarch revives the pristine energy and zest of the Greek mind. In that sense Hypatia’ s life was significant, and definitely a watershed in human history.